Offset and Quavo are defending Cardi B from an internet backlash for saying she drugged and robbed men. Cardi Bs critics went into her old archive and dug up a video where she boasts about drugging and robbing men. The clip went viral on social media earning her a swift backlash from some folks who think that she is setting a terrible example for her young fans. The Bronx rapper has since released a full-length statement apologizing for the video while adding that she had to do things in the past that she wouldnt do now to feed her family. Her husband, Offset comes through like a real champ and let her haters know that he is with her on this one and everything else that is to come. 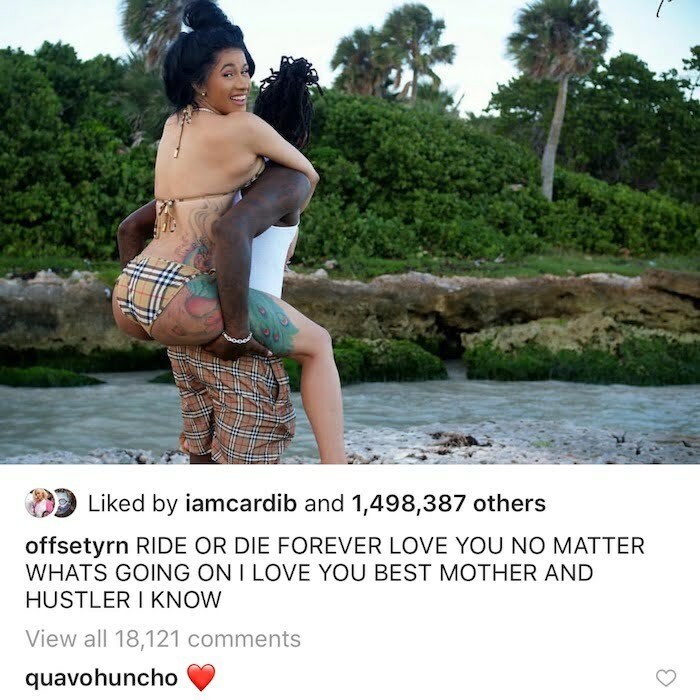 RIDE OR DIE FOREVER LOVE YOU NO MATTER WHATS GOING ON I LOVE YOU BEST MOTHER AND HUSTLER I KNOW, Offset wrote on Instagram while posting a photo of himself and his wife having a good time. Offset’s Migos band member, Quavo, left a comment on the post with a heart emoji, a sign that he too is riding with her on this one. The Migos clan always ride or die for each other, and now that Cardi B is an unofficial member of the group, you shouldnt expect anything less than them riding for her.